Do Ceiling Fans Save Energy? Ceiling fans offer savings in both summer and winter. If you want to improve home energy conservation and trim your electric bill, ceiling fans can help, but only when used in concert with other energy saving strategies. With the following electricity saving tips, you'll learn how to maximize your ceiling fans and reduce HVAC dependency. Use a ceiling fan to cool your room temperature, as well as augment your home's air conditioning. Air conditioning uses more household electricity than anything else, by far. At a cost of around 36 cents per hour of operation, it accounts for a quarter of all home energy consumption, according to the United States Energy Information Administration, part of the Department of Energy. A ceiling fan, on the other hand, costs roughly a penny per hour, so the trick to saving money is using it more and central air less. To do this, it's important to know ceiling fans don't cool rooms; they cool your skin through a wind-chill effect. If you leave a ceiling fan on while you're gone for an extended period of time, it won't change the temperature of the room; it only wastes electricity. However, some experts say it helps to limit humidity and prevent mold. 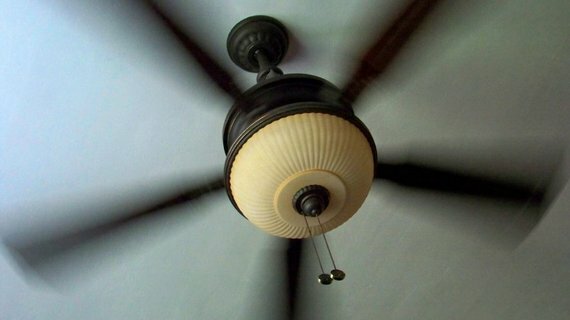 The U.S. Department of Energy says if you use a ceiling fan and air conditioning unit simultaneously, you can raise your thermostat setting by 4 degrees without a change in comfort. • Turn fans on only when you're home and using rooms in which they're located. • Increase your house temperature by 4 degrees, or more if you are comfortable. This strategy also works in the winter. If you reverse ceiling fan rotation, it pushes warm air downward, so you'll save money by dropping your thermostat to find your ideal room temperature. To read more tips, check out Brent's original article Do Ceiling Fans Save Energy? here. This article originally ran on Angie's List and is part of a series on the topic of Home Cooling. The series aims to educate readers about cooling their homes in efficient ways. For more information about Angie's List, visit AngiesList.com.